Depart DublinDepart Dublin's fair city and It's onwards to the North of Ireland. A wonderful tour lies ahead, with a short 2 hour drive to Belfast on the brand new 'Peace Highway'. The drive up will be broken up by an interesting and lovely little stop at Monasterboice! MonasterboiceAfter stories en route we'll take a drive off the highway and down the much less beaten path to visit the haunting ruins of Monasterboice. See a real 10th century round tower and learn how our ancestors took refuge from the Vikings. Touch the most beautiful Celtic crosses in Ireland, hand-carved by monks before power-tools in the 9th century. BelfastArrive in lovely Belfast where we have 2 HOURS FREE-TIME. Consider an optional world famous Black Taxi tour of the Falls and Shankill Roads along with murals of troubled times and also the peace wall. Highly recommended by Lonely Planet and all the leading guidebooks... and Paddywagon! OR Take the free time for lunch and shopping time in Belfast bustling downtown shopping area. Excellent shops, much cheaper than Dublin! Use your free time to explore this magical city. Visit the Crown Liquor Saloon, the Grand Opera House or check out Belfast's own leaning tower “Albert Clock” Loads of time for a tasty and traditional Ulster lunch ! 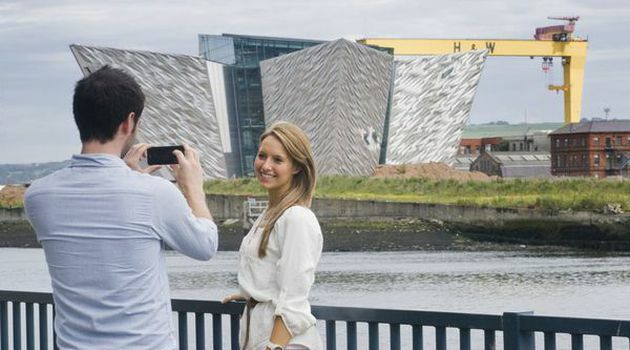 The Titanic ExperienceENTRY INCLUDED FOR THE TITANIC EXPERIENCE (value €15) Depart city center and drive to the docks to visit Belfast's Number 1 attraction, the Titanic Experience! We take you on an amazing journey, from her conception in Belfast in the early 1900's, through her construction and launch, and her infamous maiden voyage and catastrophic demise. This is one of the world's most famous visitor attractions.